30 www.coalage.com September 2018 drive systems The Benef its of Modern Drives Several new drive configurations offer improvement for different aspects of mine operations by jesse morton, technical writer At the dawn of the 20th century, a poten- tially game-changing underground mate- rials conveyance system was being trialed in north Britain. At a Derwent Colliery mine, near Newcastle, a prototype steel and cast-iron centipede snaked along a longwall face. The conveyor, comprised of a series of linked 6-ft-long, 6-in.-deep sheet-iron troughs, and was nothing short of revolutionary in its application. Prior to it, "the idea of carrying the coal along the face of longwall workings by means of a conveyor never seems to have been con- sidered seriously." 1 Bringing joy to the head office, mon- ey could be saved, if only a drive-related problem could be solved. The conveyor was powered by a 7-hp electric motor, "wound for 180 volts." It was initially driven by flat leather belt. "This arrangement had the advantage that when the conveyor was overloaded, the belt would slip and save any damage being done to the motor." The slippage, however, proved excessive. The solution was a modified chain drive. "As there is no slip on a chain drive, a copper shearing-pin device is used, so that the pin will shear when more than a certain load is on, and also provide a me- chanical cutout for the momentum of the armature in case of a certain jam." Today, suppliers in the drive solution space strive for innovations that enable the same level of step change that was initiated in 1905. Reviews of some recent innovations illustrate that point. Besting the Conventional An ABB gearless conveyor drive (GCD) matched with a low-voltage perma- nent-magnet motor logged a better per- formance than a conventional drive-and- motor combo during a trial at an open-pit lignite mine in Cottbus, Germany, accord- ing to a white paper by ABB. The pilot project established the feasi- bility of installing GCDs on mobile mining machines and shows the suitability of per- manent-magnet torque motors to drive conveyors, ABB reported. The results reveal that on both productivity and energy effi- ciency metrics, GCDs are viable alternatives to conventional geared drives, it said. 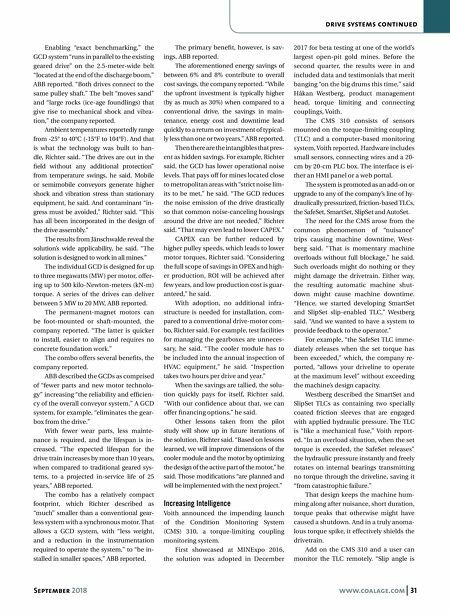 "The potential for energy savings, reduction of failure rate and maintenance have also been demonstrated," ABB reported. "The gear- less solution has performed better in regard to dynamic accuracy and overall efficiency than the existing traditional solution," ABB reported in a separate press release. Leadership at Lausitz Energie Berg- bau AG (LEAG), owner of the Jänschwalde mine, which staged the project, lauded the solution. "The interest of LEAG in this pi- lot project mainly lies in the expectations related to higher efficiency, lower wear, and hence less expenses for repairs and maintenance," said Peter Scholze, head of services, open-pit mines, LEAG. "Since commissioning has taken place, the drive has been running smoothly." Further, Jänschwalde's "operations and maintenance team found the new sys- tem to be easy to learn, understand, and use, without any major difference in op- eration or handling when compared with the existing systems," ABB reported. The proof, according to Ulf Richter, product manager, GCD, mining, ABB Process Industries, is in the numbers. "So far, during one year of operation, we measured 6% en- ergy saving and 100% availability of the drive with just two hours inspection," he said. The development amounts to histor- ic precedent, Richter said. "This had not been possible to-date from technical and commercial points of view with the exist- ing solution based on synchronous motor technology," he said. "The key point for success was the decision to use perma- nent magnet motors." Tracing back to research and develop- ment initiated in 2013, the GCD package adopted by LEAG in June 2017 also in- cluded a frequency converter and a trans- former. 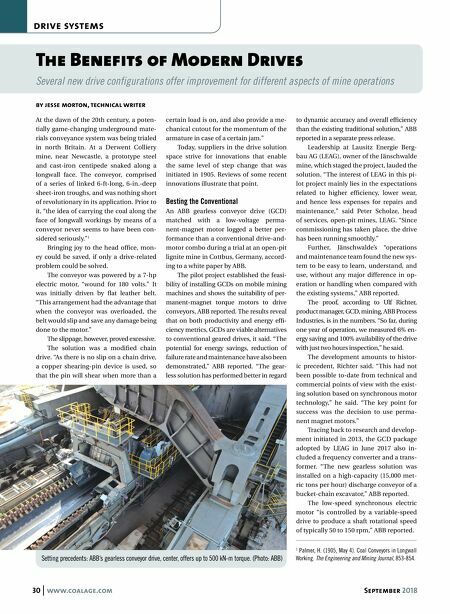 "The new gearless solution was installed on a high-capacity (15,000 met- ric tons per hour) discharge conveyor of a bucket-chain excavator," ABB reported. The low-speed synchronous electric motor "is controlled by a variable-speed drive to produce a shaft rotational speed of typically 50 to 150 rpm," ABB reported. Setting precedents: ABB's gearless conveyor drive, center, offers up to 500 kN-m torque. (Photo: ABB) 1 Palmer, H. (1905, May 4). Coal Conveyors in Longwall Working. The Engineering and Mining Journal, 853-854.